The Sea Eagle 370 is an inflatable kayak designed for beginners and expert kayak enthusiasts of all the ages. It is a lightweight and affordable one and is ideal for taking along for fishing or for sea voyaging. It is designed with a seating arrangement for one or two people and has an overall very portable design. If you’re looking for Sea Eagle 370 reviews, read this post. The Sea Eagle 370 is an inflatable kayak designed for beginners and expert kayak enthusiasts of all the ages. It is a lightweight and affordable one and is ideal for taking along for fishing or for sea voyaging. It is designed with a seating arrangement for one or two people and has an overall very portable design. If you’re looking for Sea Eagle 370 reviews, read this post. Here is a quick recap on what we think of this kayak. Can hold up to 650 lbs, hence might fit up to 3 people. The 370 is becoming one of the most popular kayaks in the U.S. The kayak can be folded and packed into a very small and compact size and can be easily carried anywhere. It can also accommodate around 3 people but it is more suitable for two people because of its design. This inflatable kayak is packed with amazing features and is known for its reliability, durability, and performance. It offers a fun experience to the beginners and professional paddlers and thus it is suitable for everyone. If we do a comparison of Sea Eagle 330 Vs. 370, we find out that they are almost similar except for some features. Following are the main features of the 370. The 370 hull is a very sturdy one as it is made up of 38 mil PVC (PolyKrylar), which makes sure that the material is resistant to both sun and water. This material also provides good protection against abrasion and collision and thus keeps the kayak free from daily wear and tear. The hull consist of three inflated chambers, which makes it more rugged and durable. Even if one portion gets punctured by mistake, the other two parts will be there to support the weight. The floor, starboard walls, and port all are inflated in the 370 Pro. The Sea Eagle Kayak also includes a repair kit which allows the users to mend any tears or holes in the structure. The hull is very easy to maintain and clean, it can be cleaned using water, soap and clothes. The Sea Eagle Kayak is very comfortable and it offers a convenient way of kayaking. It can be easily deflated at any time and place and can be fitted into any small bag. The 370 is ideal for travelling and can be taken anywhere because of its portability. It can be carried along with one person because it can be folded to a small size. The 370 hull weighs only 32 pounds and can be inflated in only 10 minutes without any difficulty. Other hulls are quite difficult to manage because of their rigidness but this one can be inflated and deflated in a matter of minutes. It can carry around 650 pounds and has a length of 12 feet when inflated. 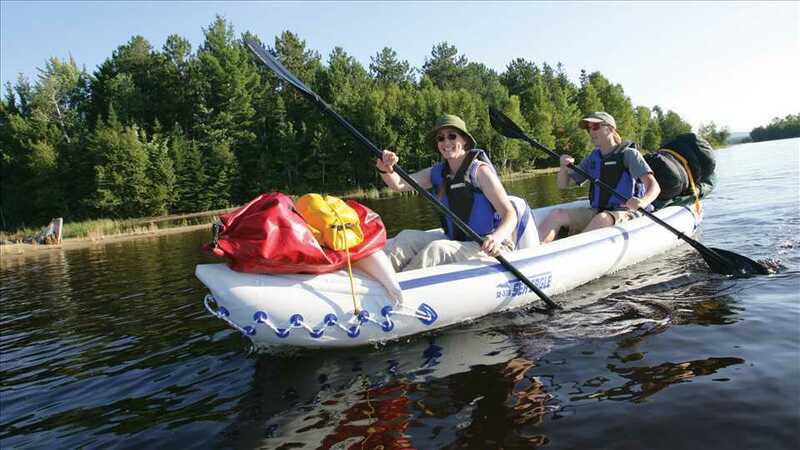 Some 370 accessories include inflatable spray skirts, a drain valve, inflatable seats, and stabilizing skegs for improving the speed and stability of the kayak. The Sea Eagle Kayak 370 consists of two seats that are inflatable and they are very comfortable too. Though there are two seats but the Kayak can easily accommodate more than two people, especially children can easily fit in there. There is enough space for people to sit easily because it has a good weight limit too. The professional kayaks are designed so as their hulls cut through the water smoothly and track properly. However, inflatable kayaks aren’t able to do this because they don’t have hulls designed that way. Fortunately, Sea Eagle has included two rear skegs in the kayak so that it becomes easier to track the speed. Because of these skegs, paddling gets easier and the kayak navigates smoothly in the water. Without these skegs, an inflatable kayak would float all around the water haphazardly and a lot of energy would have been wasted paddling. The skegs are made up of hard plastic and thus they don’t get damaged due to hitting. Check out other river kayak models here. The 370 consists of a 5-tube I-beam floor that allows the paddler to do the activity properly and effectively. Because of the presence of this beam, paddling gets much easier and comfortable. The I-beam floor adds rigidity to the kayak floor which is normally not present in most of the inflatable kayaks. This beam also improves the speed and navigation of the kayak. Valves are an important part of an inflatable kayak because it makes the kayak perform more effectively. These valves are present on each air compartment and are very easy to use too. Most of the valves are prone to damages and they start losing air quickly. However, these valves are designed to pump the air in and don’t allow it to escape. The opening of these valves is large enough so that inflation and deflation gets easier. To make it more secure, the hull has mold O-rings and thus there is no chance of losing them. Another important feature of the 370 is that it is certified by the National Marine Manufacturers Association (NMMA). It also complies with the American Boats & Yacht Council (ABYC) rules and regulations. This is a very important thing to consider before buying kayaks because safety should be given utmost importance while sea voyaging. This kayak is certified for its safety and reliability by NMMA and ABYC both. It is very affordable as compared to other kayaks of same features. It includes premium quality air valves which allow it to navigate and maneuver freely and smoothly. The Poly Krylar material is thick and tough. It is very durable and has a rugged construction. Comes with very handy accessories. Very versatile and can be used for many purposes. It offers a 3 year warranty which is very useful, and a 180 day risk-free trial is also provided. The customer support provided by Sea Eagle is excellent. The tracking performance is good but not excellent. Due to lack of support of the Deluxe seats, paddling gets harder. It’s not for racing because generating good speed can be difficult. The 370 is available in two models and that are Deluxe package and the Pro package. The main difference between the two models is that of the price, that is, the Deluxe version is $30 cheaper than the Pro model. Though both the models are almost the same but there is a small difference that makes one model cheaper than the other. The Pro version has better and more comfortable seats as compared to the Deluxe model. The Pro model has a better back support and if a person is paddling all by himself/herself, the back support really matters. The Sea Eagle 330 is quite similar to the 370 Kayak but it is shorter and lighter than it. SE 330 weighs only 26 pounds and is 11 feet long when inflated. It has a weight capacity of 500 pounds and can hold two adults only, unlike 370 which is more spacious. 330 Pro is cheaper than 370 and is quite maneuverable too. If you read any Sea Eagle 330 review, you’ll come to know that it is very easy to assemble or inflate it and it hardly takes around 6 minutes to do the task. The 330 is great for those people who want a lightweight and more maneuverable kayak that can accommodate only 2 people. If you want to accommodate more than 2 people then you can consider the option of 370 because it is more spacious. If we talk about the similarities between the Sea Eagle 330 vs 370, they both are quite affordable, include 2 skegs, have an I-beam construction, and consist of Deluxe one-way valves too. If you’re looking for a good quality inflatable kayak, 370 is a good choice. Compared to other inflatable kayaks it is expensive but is very affordable than the non-inflatable kayaks. With 370 you’ll easily get to enjoy fishing, white watering, or sea voyages. 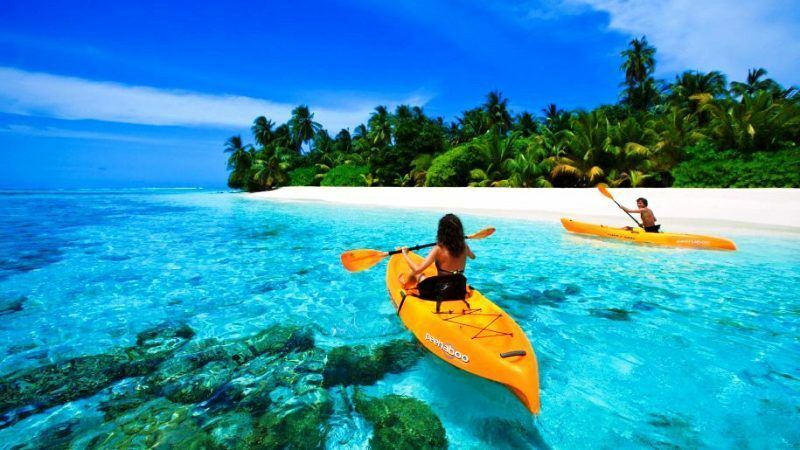 It offers convenient kayaking as it is equipped with all the features needed for a good experience. We hope that our sea eagle 370 reviews did help you with your buying decision. Overall, it is a good kayak to invest as it delivers good value for money. It’s very versatile and you can take it along for camping, sailing, or fishing easily. Its portability and stability makes it a good choice and since includes everything for a great paddling experience, this kayak is a must buy.